Whether you love Seadrill or hate it the first quarter probably gave you what you were looking for. The offshore drilling industry has taken a pounding in the past year as oil prices have collapsed. But offshore drillers aren't in the world of hurt that the market might imply... at least not yet. And that's giving both bulls and bears all the fodder they need for one of the industry's most volatile stocks. Seadrill's (NYSE:SDRL) recent earnings report showed plenty to both love and hate, depending on how you look at it. The company's revenue fell slightly to $1.24 billion and net income was $448 million, or $0.86 per share. But it's what's behind those numbers that investors have their eyes on. Anytime an offshore driller can have 93% economic utilization for floaters and 98% for jack-ups, as Seadrill did in the first quarter, they're bound to have a good quarter. $492 million in cash generated from operations also helped reduce net interest bearing debt from $11.76 billion at the end of 2014 to $11.35 billion after the first quarter. The rest of 2015 should be pretty good as well. The company has 85% of the available rig days in 2015 under contract, so it should be profitable throughout the year. Image source: Investor presentation by Seadrill. If you were only looking at one quarter, you would think that Seadrill is in great position: $0.86 per share in earnings extrapolated for a full year puts the $12 per share stock price at a P/E ratio of just 3.5. That's where bulls see incredible upside in the stock, provided offshore drilling demand picks up. But the future may not be as rosy as the first quarter was. Showing just how slow contracts are in offshore drilling today, Seadrill signed just one contract in the quarter, a one-year deal for a jack-up rig worth up to $35 million. That's a snail's pace, particularly when you consider that Seadrill Group's backlog fell from $17 billion to $15.5 billion in just one quarter. To make matters worse, by the end of 2016 Seadrill has $1.3 billion in debt maturities and $3.5 billion in yard installments for newbuild rigs. That's a lot of cash to come up with just as earnings are expected to decline. So, if the offshore drilling market doesn't improve quickly Seadrill could drown under the weight of over $11 billion in debt, which is what bears are pointing to as the biggest risk for the stock. Ultimately, the question for Seadrill's investors is this: When will offshore drilling activity pick up again? No matter how you slice it, 2015 will be slow. Drilling companies big and small slashed their capital budgets for 2015 because the price of Brent Crude Oil was $55 per barrel coming into the year and hit a multiyear low in the mid-$40s in January. But since then oil prices have improved, as you can see below, and onshore we're seeing the number of rotary rigs in service stabilize, indicating that drilling is continuing at some oil fields. 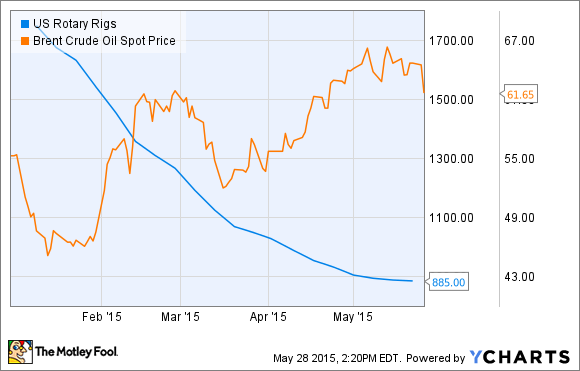 If the number of rigs is bottoming onshore, it could mean a bottom in demand offshore as well. If that's the case, we should see demand for rigs pick up as rigs come off contract late this year and oil producers look to at least maintain production going forward. If demand does pick up it will help all offshore drillers, but it'll help Seadrill disproportionately more. You can see in the chart on the left that Seadrill has just one floater rig built before 2000, lowest of the major players in the industry. Since newer rigs with greater capabilities will be in higher demand for oil explorers it's only logical that Seadrill has more upside than its competitors when demand returns. Seadrill just has to survive until then and the backlog through the end of 2016 will help ensure that. The risk is high when thinking about investing in Seadrill stock. But I think we're at the bottom of the offshore drilling swoon and when the recovery begins no other company is positioned as well as Seadrill. If demand does return, the stock could easily double or more, just given the fact that it has an extremely low valuation based on recent earnings. I think Seadrill has been tossed out with the bathwater by the market and it's one of the best positioned companies when oil drilling picks up again. To me, that will only be a matter of time.